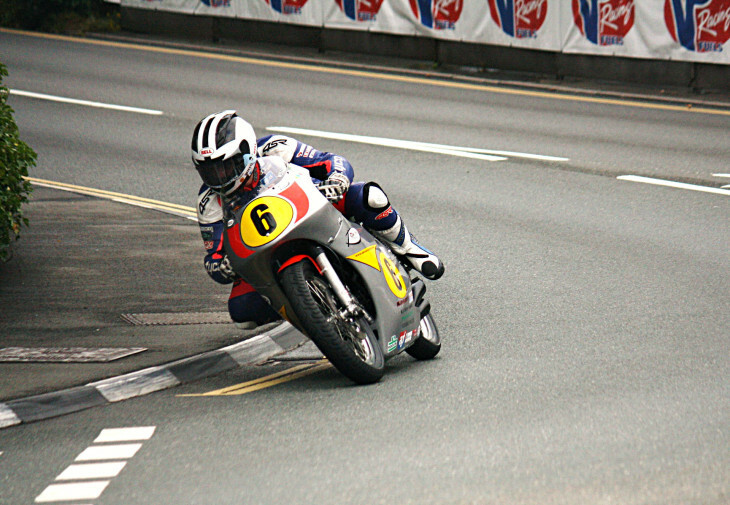 If you think about it, one of the most compelling endorsements a helmet can receive is to be worn by a racer who competes in “real roads” events like the Isle of Man TT. Roadracers compete among curbs, trees, fences, rocks, and countless other objects—they depend on their helmets to protect them from the same roadside hazards we all encounter every day. It’s hard to say whether their experiences at incomprehensible speeds can translate into a helmet being protective in the conditions you and I ride in. But when a roadracer chooses to rely on a particular helmet, it’s a serious vote of confidence. In 2013, William Dunlop chose Bell and began wearing the Star Carbon Special Edition helmet you see here. If you’re not familiar with him, William is the nephew of the late roadracing superstar, Joey Dunlop. William’s father Robert (Joey’s brother) was also a roadracing legend who won six Isle of Man TT races, as well as others at Ireland’s premiere roadrace, the Northwest 200. Of course, there is also William’s younger brother, Michael Dunlop, a raging bull of roadracing talent who has already won 12 Isle of Man TT races. Suffice to say, the Dunlop family has racing in its blood. “It’s just something you’re born into,” William has said. One way that William and Michael pay tribute to their roadracing lineage is through their helmet designs. Their father Robert was known for his striking black & white helmets with scallop patterns. William and Michael have continued this tradition, both wearing helmets that are variations on Robert’s theme. William’s Bell Star Carbon is among the best-looking of the bunch. Like all good design, its simplicity gives it a timeless quality. The white areas are the only painted surfaces. They contrast with the satin black of the raw carbon fiber to produce a design that is eye-catching from a distance. It is even more intriguing the closer you look; the woven carbon fibers appear as though you could reach in and touch them. Fit-wise, we all have different brands or models that work with our heads. For me, Bell’s Star Carbon has a positive, totally-engaged feel all around. There are zero hot spots or pressure points. In fact, I recently competed in a 6-hour endurance race wearing the helmet in complete comfort. The Star Carbon Special Edition boasts significant features, as you’d expect for its $699 MSRP. For starters, there’s the light weight of 1500 grams. Just looking at that figure might not be meaningful (it wasn’t for me), but picking up a Star Carbon speaks volumes. When I first picked up the helmet it was packed inside its shipping box with accessory bag and other bits and, even then, I thought “holy crap, this thing feels light.” It’s that noticeable. Other key features of the helmet are its exceptional air vents. In fact, they work so well that they create a healthy amount of noise. But, if you’re a warm weather rider, it’s likely a worthwhile tradeoff for the ventilation. The “bang for the buck” award of the helmet’s features goes to the little magnet at the tip of the chinstrap. Unlike the cumbersome snap or clip that most manufacturers use to keep the chinstrap from dangling, the magnet almost literally fastens itself. It’s a simple innovation that really adds value. Hands down though, the best comfort/convenience feature of the helmet is the Transitions SolFX photochromic faceshield. While it doesn’t come standard with the helmet, this self-darkening shield is worth every penny of its $120 price tag. On a recent 2000 mile tour I wore the helmet in conditions ranging from blinding sunsets to ink-black nights on middle-of-nowhere roads. Grey skies, rain, and fog also made a few cameos. Through it all, the Transitions shield was perfect for any condition. It darkens to nearly the degree of a traditional tinted visor, yet in low light or night it’s nearly clear. This eliminates the need for two faceshields or the painful sunglasses-inside helmet trick. I never squinted in the sun, nor strained to see at night. It is a seamless solution. 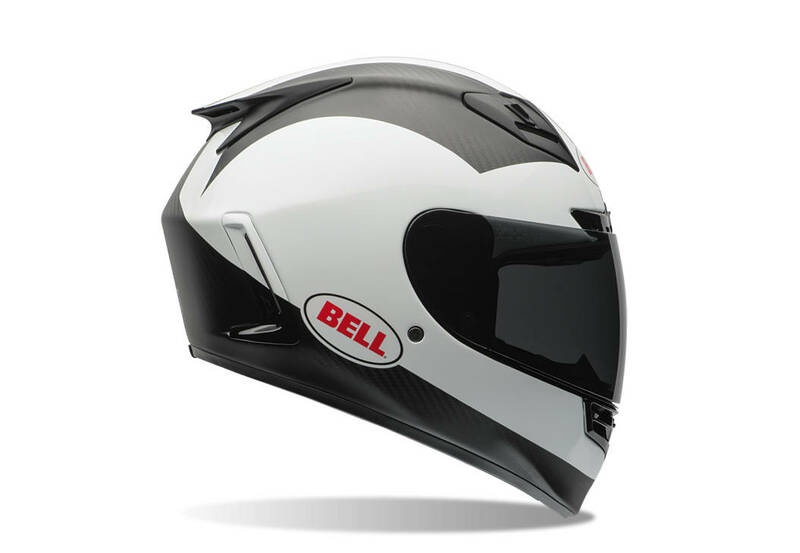 If you are in the market for a top-rated (Snell M2015) helmet with clean, timeless good looks, and a slew of practical non-gimmicky features, then consider the Bell Star Carbon Special Edition William Dunlop replica. Visit Bell’s web site for additional details and color options. smartest thing is to go try one on in a shop, then find a closeout deal online. got caught in a monsoon this past spring, it was brutal, but the shield never fogged up, never. I recently got the transitions shield, which is awesome, my only concern is that its ability to change from clear to dark may weaker over time (I store it in the closet when not riding to not stress the transitions bit, they recommend it in the pamphlet). overall, I’d say it’s the best lid Ive ever worn, great comfort, awesome ventilation, excellent chin strap retainer, and light/aerodynamic. the only thing I would change is slightly thicker cheek pads as I got used to the arai fit over the years. if it was stolen I’d buy another over anything out there. Yes, because IOM TT riders obviously have a special knack for sober and realistic risk assessment. check the bell website, they offer a custom shape fitting deal. I expect that it is what racers get, can’t imagine them buying off the shelf. One nice thing about Arai’s $1,000 Coarse-Air helmet is that it makes a $699 helmet seem reasonably priced. I really wonder if these high price-points really translate to a safer lid, or even one that lasts longer or is more comfortable. The helmet I’m using cost about $300 on sale; it’s very comfortable, has better venting than any other I’ve used, but best of all: the liner is both washable and replaceable. In FL the liners are what goes first; having a replaceable one will extend the life of the helmet considerably. So far I’ve only seen on brand offer replacement liners. They must all meet the same SNELL/DOT standards but technology like MIPS is starting to attempt to exceed the safety levels mandated by the government. If it’s significantly lighter weight than a fiberglass or polycarbonate shelled helmet with the same level of protection then there’s your comfort improvement (interior quality assumed). Comfort is subjective, of course. All the tech fails if nobody likes the fit. I am a HUGE fan of Bell’s Carbon Star helmet. I am more of an oval head rather than the Arai round. I have the Cerwinske version which is another white on clear carbon design. I am between sizes for a track-day helmet. I went with a Medium as I felt the Large would loosen up over time. Even with the snug/tight fit it is really comfortable. I did end up getting another Large when I found a clearance sale and also bought the photochromic shield. I was really amazed at how dark the shield gets on a sunny day. Most other photochromic glasses I’ve tried never get dark enough. This shield is worth every penny! Did you get yours for free like William did? The headline says the article is an MD Product Review, but it reads more like a pure promotion for this Bell helmet. If the vents weren’t utter trash and didn’t let rainwater into the helmet to drip on my nose, I could recommend this helmet. If you live in a desert or don’t ride in the rain or cool weather (where the fog-resistant SolFX fogs up anyway), this is a decent helmet. In strong crosswinds the magnet has a tendency to let go, which can be annoyying too. It’s not worth $700 given its deficiencies. Buy them on sale, like all my fair-weather riding friends that like them do. and have ridden in horrible rain storms with it, never fogged up, sidewinds never blew the strap loose. at the end of the day, I could give a sh!t what other people do with their money, but I am stoked about my purchase, and you can find close out deals out there on pain jobs that won’t be used next year. also, the non carbon star is every bit as good, the same all the way around, except slightly heavier, but still lighter than the Arai in my closet.